The large body of gorillas needs abundant and adequate food to work properly. They are mostly herbivores, but instead of eating more fruits than herbs, like most monkeys and chimpanzees do, they consume more foliage and other plant parts. It is not possible to generalize the diet of all gorillas. There are two species with two subspecies each, and they all inhabit different areas. The eastern gorilla is far from its western relative, and since they live in specific regions at different altitudes, with particular vegetation in each place, the components of their diet often differ from species to species, between subspecies and even according to the season of the year. 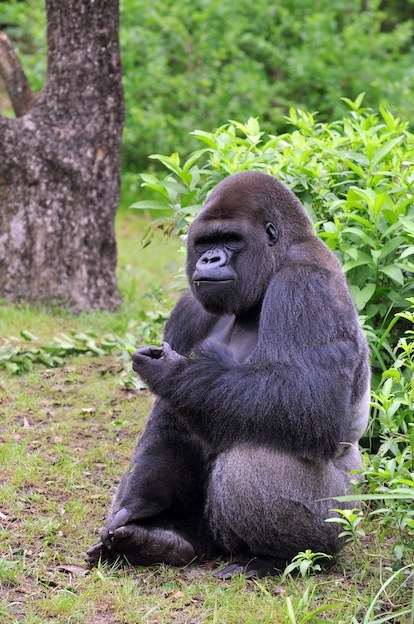 An adult gorilla is capable of consuming 18 to 20 kilograms of food every day. Gorillas eat leaves, stems, fruits, bark and buds, and occasionally small invertebrates like ants, worms, termites, and larvae. The Western Lowland Gorilla subspecies (Gorilla gorilla gorilla) eat the fruits of more than 100 species of trees, 97 of them produce fruits seasonally; about 67 percent of their diet are fruits, 17 percent are leaves, and the rest are seeds, stems, caterpillars, ants, and termites. Sometimes, they enjoy aquatic plants. The other three gorilla subspecies consume much less fruit. The Cross River gorilla subspecies (Gorilla gorilla diehli) is known to consume fruits, leaves, stems and occasionally, invertebrates. The Afi Mountain subpopulation consumes many herbs of the genus Aframomum, but in the rainy season when available they prefer the species Amorphophallus difformis. The mountain gorilla (Gorilla beringei beringei) lives in areas of high altitude above the sea level, so their habitat lack of fruit trees. Therefore, they consume leaves, stems, and buds of 142 species of plants, representing up to the 86 percent of all their diet. Only 2% are fruits, 3% flowers, and 7% roots and invertebrates. The eastern lowland gorilla subspecies (Gorilla beringei graueri) feed on at least 104 species of plants. Their diet varies seasonally, and it is very diverse. In times of abundance, fruits can reach up to 25 percent of their total consumption. Males eat more than females. An adult male can consume 18 to 20 kilograms of food every day while females consume two-thirds of that amount. The amount of food consumed evidently vary among individuals. In areas near human communities, gorillas are attracted by crops, which they can eat. They hardly drink water directly from the source because they get the liquid from the vegetation they eat. The eastern lowland gorilla (Gorilla beringei graueri) walks over 1,000 meters a day in search of food sources. 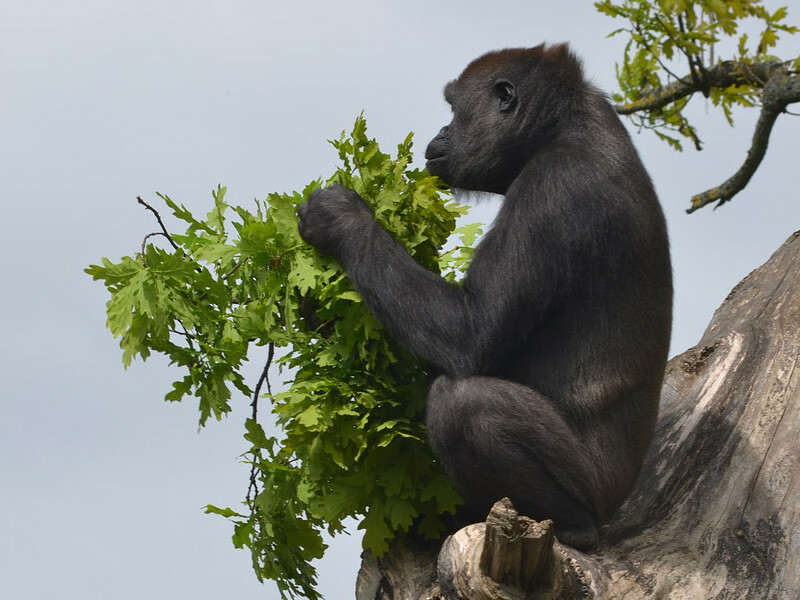 Due to the relatively low energy value of a diet based on leaves, stems, and herbs, most gorillas spend a lot of time in feeding-related activities to achieve the appropriate nutrition needed. To get all the food they require, they must travel in search of food sources. The eastern lowland gorilla cover long distances to find fruit; in fact, they are the subspecies that move longer distances: on average, up to 1,105 meters per day. Once they find a food source they select specific parts of the plant either the leaves, stems or roots, and tear them, or take the whole plant directly into their mouth to tear off its parts. They have no problems with plants on hard soil. Their strength allows them to pull out any plant from the ground.